Work continues on the Fred & Pamela Buffett Cancer Center lobby, which will feature artwork by Brooklyn artist Suzy Taekyung Kim. 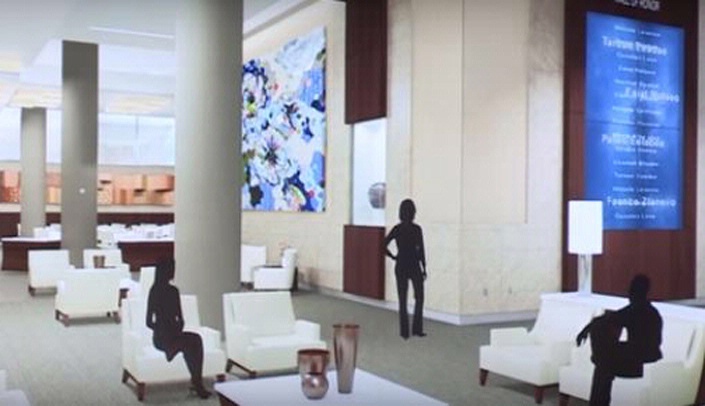 Above is an artist's rendering of the lobby, featuring Kim's artwork. Brooklyn artist Suzy Taekyung Kim was one of two artists chosen from a field of more than 400 to have her work featured in the Fred & Pamela Buffett Cancer Center. Recently, Kim toured the construction site where her large-scale painting for the lobby will be placed. The painting will be approximately 12 feet high by 16 feet wide and will consist of eight customized wood panels that create one large surface. Kim uses color to create weaved images of foliage and explosions, and accumulates multiple layers of diluted paint, stains, acrylic paint, mica and gold leaf. To see a video of the tour, click here. The second annual WE CAN event will kick off on Thursday and run through Friday on all seven NRG Media radio stations. Listeners to diverse types of music, talk and sports will hear stories of the milestones achieved at UNMC and Nebraska Medicine in the past and hear the bold plans for the future -- building the nation's finest cancer research and treatment facility here in Omaha. Most importantly, they will hear from patients who've benefited from the care, treatment and research provided at the med center.